Nine straight wins and 15 consecutive unbeaten games; but that might count for nothing now for Central FC. The “Couva Sharks” were contenders for the Pro League’s million dollar first prize at kick off last night. 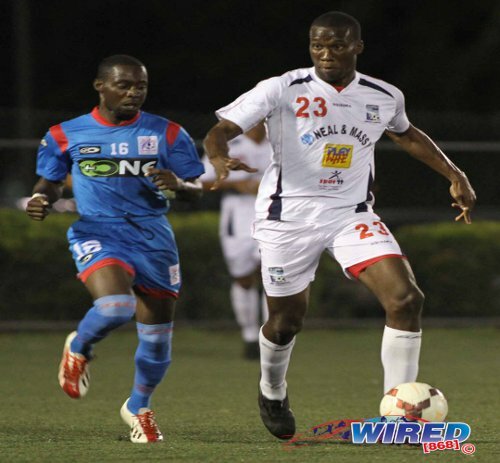 Now, even their chance of a top two finish and a place in next year’s CONCACAF Champions League is in jeopardy after a typically emphatic double from Trevin Caesar paced North East Stars to a 2-1 win over Central at the Hasely Crawford Stadium. 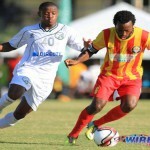 Photo: North East Stars striker Trevin Caesar (left) shoots to goal against Caledonia AIA. The result saw Central slip to third as Point Fortin Civic, who whipped San Juan Jabloteh 3-0 in Couva, skipped into second spot last night. Defence Force poses the bigger long-term threat to Central, though. 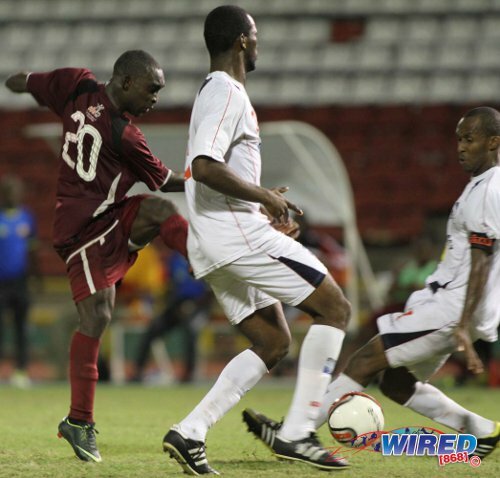 Veteran Defence Force captain and right back Cory Rivers scored arguably his most important goal for the defending champions as he slammed home a late winner, two minutes into extra time, to see off Police FC in Couva. The result brought the “Teteron Boys” level on 38 points with Central although the latter team has a better goal difference. DIRECTV W Connection leads the standings with 45 points and has just three games remaining. Two of those outstanding matches will be against Defence Force and they will decide the destination of the 2013/14 Pro League trophy. At present, Defence Force has three games in hand apart from the two meetings with Connection. 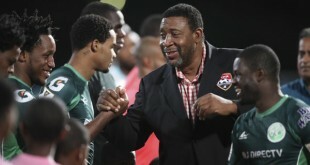 If coach Ross Russell’s men win those, then a win and draw against Connection would cap the most remarkable title chase of Trinidad and Tobago’s professional era. Two years ago, a youthful Connection team pipped T&TEC to the crown on the final day of the season. But Connection did not lose its vice-captain to a heart attack in mid-season or take a month off from football duties to tackle a spiralling murder rate. Carter died from a heart attack on 28 February 2014. Connection is deservedly first at present; the league table does not lie. But it would take a heart of stone to not warm to Defence Force’s remarkable race. At the other end of the table, there was an emotional moment too as bottom placed St Ann’s Rangers snapped a 16-match winless streak with a shock 3-2 triumph against Caledonia AIA at the Hasely Crawford Stadium. 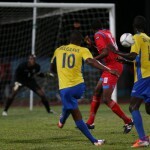 After 19 league games under former coach Gilbert Bateau, Rangers had three points. Since Anthony Streete’s return, the St Ann’s based squad is unbeaten from two league games as a draw against Jabloteh was followed by last night’s result. Even Streete would have a hard time convincing anyone that yesterday’s triumph was wholly manufactured on the training ground, though. Not after Kennedy Isles’ stunning opener. There seemed to be nothing on when Isles, a St Kitts and Nevis international, hustled three Caledonia players for the ball in the centre circle. Unsurprisingly, the Caledonia defence wilted under pressure. But what Isles did next took the breath away; as the 22-year-old hammered a volley that flew half the length of the pitch and over the head of stunned Caledonia and Grenada international goalkeeper Shemel Louison before dipping below the crossbar. You might not see a better strike this year than that. Photo: Caledonia AIA forward Jamal Gay (right) weighs up his options while St Ann’s Rangers attacker Kennedy Isles looks on during a previous contest. Isles came into his own yesterday with a brilliant double against Caledonia AIA. Isles followed this up with a clinical finish in the 44th minute after a through pass from 18-year-old striker Kadeem Corbin. Caledonia, who was without Densill Theobald and Stephan David, equalised twice; first via a fine shot on the turn from Denron Frederick, Louison’s compatriot, in the 33rd minute and then with a simple close range Keyon Edwards finish after horrible Rangers defending from a Nathan Lewis corner kick. But, seven minutes from time, Rangers took the lead for the third and final time as Keron Cornwall prodded over the goalline after Caledonia failed to defend a set piece to spark wild celebrations from the youthful team. The air was still bristling with rebellion when Stars coach Angus Eve led his team out to face his former mentor and Central boss Terry Fenwick. 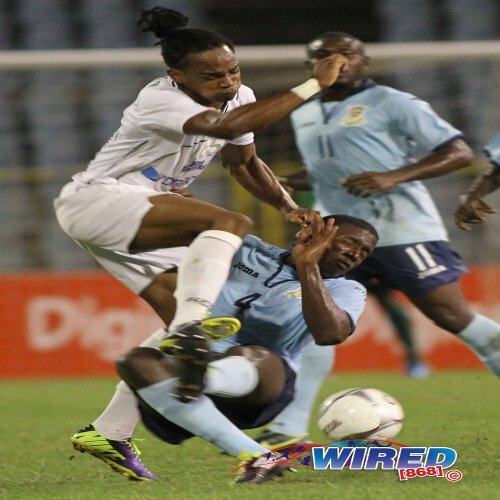 Their two previous league meetings this season ended in draws and Eve would not have forgotten the second clash, which was played at the same Port of Spain venue on February 7. A dodgy late penalty helped Central escape with a 1-1 tie and Eve and midfielder Keithy Simpson saw red in the immediate aftermath of the match as they shared their disgust with referee Neal Brizan. Revenge, goes the cliché, is best served cold. 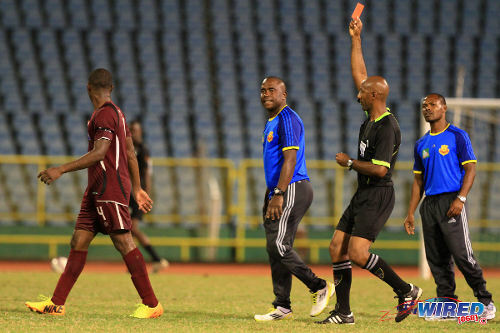 Photo: Referee Neal Brizan (second from right) flashed red at North East Stars midfielder Keithy Simpson (far left) and head coach Angus Eve (second from left) after the pair fumed at a controversial late equaliser by Central FC during their clash in February. Caesar, Stars’ pint-sized Tasmanian devil, had banged in 12 of his team’s 22 goals before kick off last night. But the former Trinidad and Tobago national under-23 striker scored just once in four previous clashes with Central this season. If Central could keep Caesar quiet once more, the Sharks’ million dollar dream would remain alive. But Fenwick’s men had a rude awakening ahead. A slip by Central defender Akeem Benjamin allowed Caesar to take possession at the right hand side of the opposing box. Benjamin backed away and Caesar did not need a second invitation. Wham! Before Central and Trinidad and Tobago goalkeeper Jan-Michael Williams could blink, the ball flew past him at his near post and the Sangre Grande-based team was celebrating. Thirteen minutes later, Caesar produced an encore. Jayson Joseph, another ex-national under-23 player, crossed to the far post and, from the same unlikely angle, Caesar responded with a thumping volley that again screamed past Williams at his near post. And Eve’s team is not the sort to squander two goal leads. Jamal Jack got a clear sight on goal in the 32nd minute but could not get his effort past Stars goalkeeper and captain Cleon John. Ataullah Guerra eventually did halve the deficit from the penalty spot in the 54th minute after referee Rodphin Harris spotted a handled ball in the area. Photo: Veteran Central midfielder Marvin Oliver (left) hits the ground after a dread tackle from North East Stars ball winner Jeromie Williams. But Central never looked like conjuring an equaliser. 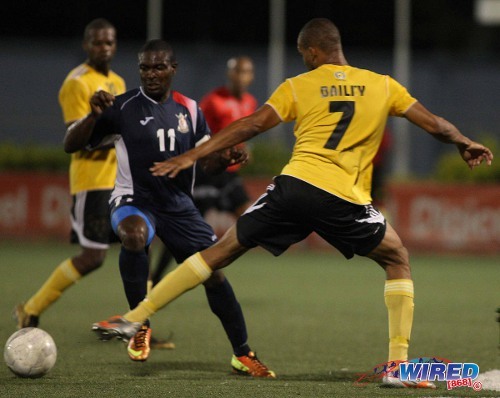 Veteran midfielder Marvin Oliver had a below-par night while Guerra was starved for space by the impressive, combative Stars midfield duo of Jeromie Williams and Joseph. Guerra’s penalty apart, Central managed one meaningful shot on target in the final 45 minutes, which was hit from distance by Plaza with venom but insufficient accuracy to beat John. Fenwick has made his disdain for Harris well known after previous fixtures. But there could be no faulting the match official yesterday. Central simply could not maintain the pace for any longer. Only Defence Force can catch W Connection now. In the eight weeks since Russell’s men returned to the Pro League after a crime-fighting sabbatical, the Defence Force has played 14 games—at least four more than any other Pro League team. During that time, the team also had to deal with the tragic passing of star winger Kevon Carter who collapsed after a heart attack in training. Yet, the Teteron Boys remain within striking distance of the crown after seven straight league wins. It would take an unlikely crash from either Connection or Defence Force to see Central finish higher than third now. North East Stars (4-4-2): 22.Cleon John (GK); 25.Keryn Navarro, 5.Aquil Selby, 19.Glenton Wolfe, 48.Jesus Perez; 7.Elijah Manners, 6.Jeromie Williams, 12.Jayson Joseph (18.Kaashif Thomas 89), 8.Keron Cummings; 15.Chike Sullivan (23.Kennedy Hinkson 23), 20.Trevin Caesar (11.Lemuel Lyons 84). Unused substitutes: 1.Stefan Berkeley (GK), 16.Franz Husbands, 40.Jomoul Francois, 49.Anthony Diaz. Unused substitutes: 25.Javon Sample (GK), 9.Dwight Quintero, 17.Rundell Winchester, 22.Keon Trim. 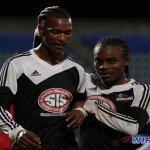 North East Stars 2 (Trevin Caesar 5, 18), Central FC 1 (Ataullah Guerra 54 pen) at Port of Spain. Ooooh…exciting stuff!!!! Can’t wait to see what happens next.